One of the things I love about being connected on social media is that I get new ideas for my teaching practically every day. It must have been three or four years ago, when I was on Twitter and I saw an educator (apologies for not remembering who it was!) posting about using story cubes in class and then a lot of teachers got into the Twitter discussion, talking about how there were using them in class, others said they were also discovering them then and there like me…I found it a brilliant idea and they work a treat, not only with Young Learners, but also with my teenage students – I have also used them with adults and they loved them! I also mentioned them in one of the workshops I did about three weeks ago, invited by the amazing Larissa Teachers Association in Greece! The teachers there have inspired me to write this post. They can be used as a filler at the end of the lesson, for them to unwind and still learn, as a warmer for the beginning for the class – even though they might get really excited and not want to continue with other things – including the adult students! This is not an advertisement for the specific product, but I also got this idea from a teacher on Twitter. 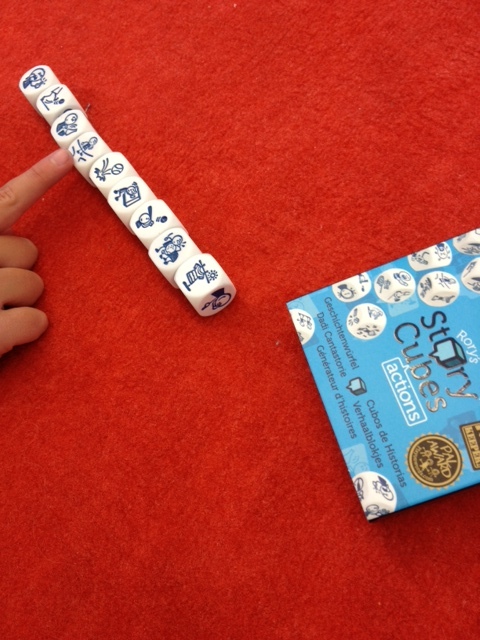 There are actually ready-made story cubes, called Rory’s Story Cubes and they come in various topics. Actions, Voyages, Original, and many more. They are actually quite affordable and their material guarantees that nothing will happen to them. The student holds them all together and shakes them, and then throws them on the table or floor as they would with normal dice. Then, they have to spend a few minutes thinking about the order in which they want to connect the nine cubes, in order to tell a story. Sometimes, if we have time, we mix up two or three boxes and they can make an even longer and funnier story! Two or three students can work at a time, preparing what they want to say and then, when the time comes for them to tell their story the collaboration and improvisation that comes up is spectacular! One student throws the dice and starts telling the story, while the other(s) have their backs turned to the storyteller and they try to guess which picture the storyteller is talking about! Students practise so many things with this game. Their grammar, and mainly their tenses and also vocabulary. They learn new items of vocabulary and they use them again and again in their next games, and they do it in a fun way too! If you prefer not to buy, and create your own, or even better create your own along with the students, I have found a Paper-Cube-Template, online, which you can print on thick paper or cardboard so that it is even sturdier to use and lasts longer. Draw or cut and paste pictures on them with the students so they can create their own character and stories. Add splashes of colour on each side of the die, so they can learn the colours, if they are beginners – we can do the same with numbers, or words, anything! There is an educator in Istanbul, Evridiki Dakos, who did something last year that was terrific! 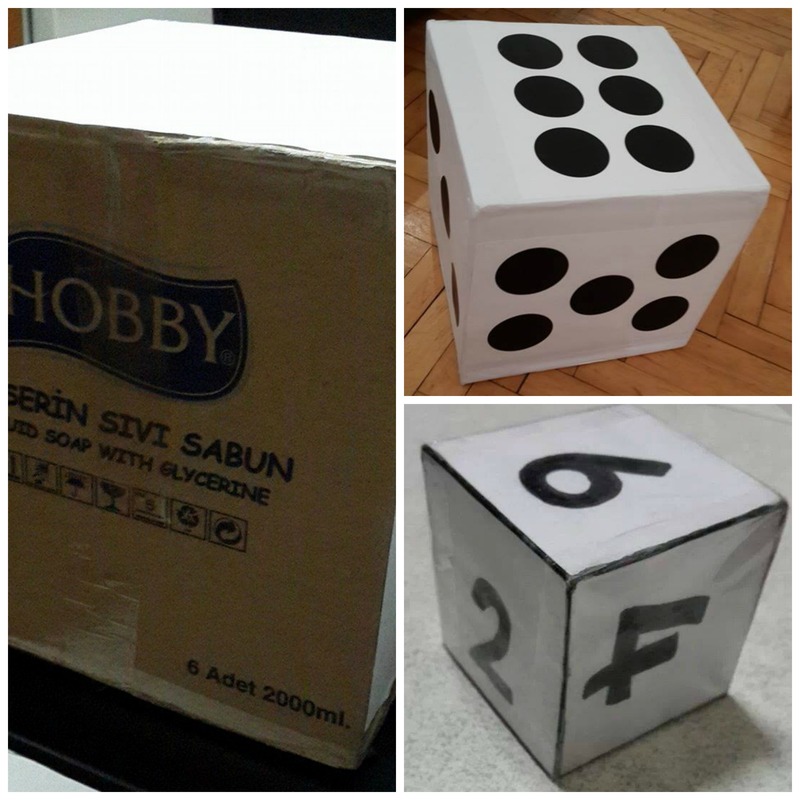 She created her own huge dice using cardboard boxes, and then laminated them with clear tape so they would be more durable and the pictures could stay in excellent condition. Here is a collage of her work and you can find more super ideas from Evridiki on her blog, ELT Teacher Development.